Oreos are America's favorite cookies. They are truly delicious. The dark bitter chocolate outside and the creamy inside are world famous. Nabisco has gone on to many versions of the Oreo. Some versions are more successful than others. Double stuff, dipped in chocolate, and mint filling all spring to mind. What about low-fat Oreos? Well, I am sorry to tell you that it won't make much of a difference. 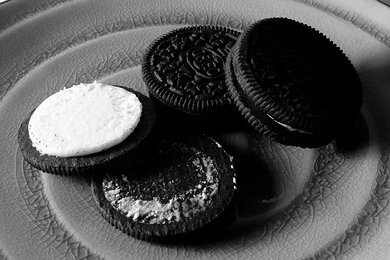 A regular Oreo is about 55 calories, and a low-fat one is 43 calories. My conclusion is that you are still eating many calories in either version. It is still junk food no matter how much fat you take out. What do I mean by "junk" food? Oreos are yummy but they lack any nutrition. Potentially, you could eat an entire bag and not get anything your body needs to function except sugar and fat. Of course, you do need sugar and fat, but you also need vitamins, minerals, proteins...... After eating an entire bag, you might still be hungry because you didn't get anything your body needs to grow. Eat them as a once a month treat - and try something healthier for a more frequent treat. I about tipped over when I spotted Oreos on your review list! This is priceless, and even more-so being the only person interested enough to comment on it! Oreos do have one really perfect usage! It might be bad parenting, I don't know... but here goes: The little punks are getting to that age where misbehaving is a full time pasttime, so I've devised a tricky solution. See, they know that once per week they get Oreos. Usually 2 or 3 of them, after dinner on Sunday. But during the week, they can "earn" one more oreo per day by doing chores, staying out of trouble, etc. Every morning I make them smoothies for breakfast. And every morning after a day they've been especially well behaved, i drop an oreo in the blender with the rest of the goodies.